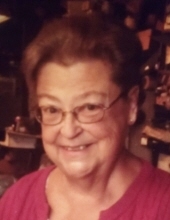 Linda (Thomas) Mathias, 70, wife of William F. “Bill” Mathias, Jr., of 711 Dooms Crossing Road, Waynesboro, passed away Friday, January 25, 2019 at her residence. Mrs. Mathias was born on October 7, 1948 in Staunton, a daughter of the late Nelson and Pauline (Thomas) Cole. Linda attended Fishersville United Methodist Church, she was a former employee with Wilson Trucking as an office secretary, and most recently employed at Eastside Auto & Machine as a bookkeeper. Linda was an avid race fan and enjoyed reading. In addition to her parents she was preceded in death by a stillborn infant daughter. In addition to her husband of fifty years, Linda is survived by a son, William F. “Bill” Mathias, III and his wife Melissa of Fishersville; two brothers, William “Doug” Cole and his wife Denise M. and James Edward “Jimmy” Cole, both of Waynesboro; two sisters, Elizabeth “Ann” Thatcher and fiancé Stuart Hanes of Scottsville, and Brenda Pike of Staunton; step-mother-in-law, Dorothy A. Mathias of Stuarts Draft; and a number of nieces and nephews. The family will receive friends from 7:00 p.m. to 9:00 p.m. Sunday, January 27, 2019 in the Coffman Funeral Home and Crematory. A graveside service will be conducted 3:00 p.m. Monday, January 28, 2019 in Sangersville Church of the Brethren Cemetery by Pastor Dwight Roetto. It is suggested those desiring make memorial contributions to the American Cancer Society, South Atlantic Division, 1445 East Rio Road, Suite 104, Charlottesville, Virginia 22901. To send flowers or a remembrance gift to the family of Linda (Thomas) Mathias, please visit our Tribute Store. "Email Address" would like to share the life celebration of Linda (Thomas) Mathias. Click on the "link" to go to share a favorite memory or leave a condolence message for the family.